What is a funnel plot? A funnel plot is a scatter plot of the effect estimates from individual studies against some measure of each study’s size or precision. The standard error of the effect estimate is often chosen as the measure of study size and plotted on the vertical axis8 with a reversed scale that places the larger, most powerful studies towards the top. The effect estimates from smaller studies should scatter more widely at the bottom, with the spread narrowing among larger studies.9 In the absence of bias and between study heterogeneity, the scatter will be due to sampling variation alone and the plot will resemble a symmetrical inverted funnel (fig 1⇓). A triangle centred on a fixed effect summary estimate and extending 1.96 standard errors either side will include about 95% of studies if no bias is present and the fixed effect assumption (that the true treatment effect is the same in each study) is valid. The appendix on bmj.com discusses choice of axis in funnel plots. Heterogeneity, reporting bias, and chance may all lead to asymmetry or other shapes in funnel plots (box). Funnel plot asymmetry may also be an artefact of the choice of statistics being plotted (see appendix). The presence of any shape in a funnel plot is contingent on the studies having a range of standard errors, since otherwise they would lie on a horizontal line. Statistical heterogeneity refers to differences between study results beyond those attributable to chance. It may arise because of clinical differences between studies (for example, setting, types of participants, or implementation of the intervention) or methodological differences (such as extent of control over bias). A random effects model is often used to incorporate heterogeneity in meta-analyses. If the heterogeneity fits with the assumptions of this model, a funnel plot will be symmetrical but with additional horizontal scatter. If heterogeneity is large it may overwhelm the sampling error, so that the plot appears cylindrical. Figure 2⇓ shows funnel plot asymmetry arising from heterogeneity that is due entirely to there being three distinct subgroups of studies, each with a different intervention effect.12 The separate funnels for each subgroup are symmetrical. Unfortunately, in practice, important sources of heterogeneity are often unknown. Fig 2 Illustration of funnel plot asymmetry due to heterogeneity, in the form of three distinct subgroups of studies. Funnel plot including all studies (top left) shows clear asymmetry (P<0.001 from Egger test for funnel plot asymmetry). P values for each subgroup are all >0.49. A located study may provide biased results for some outcome—for example, by presenting the result with the smallest P value or largest effect estimate after trying several analysis methods (selective analysis reporting). These biases may cause funnel plot asymmetry if statistically significant results suggesting a beneficial effect are more likely to be published than non-significant results. Such asymmetry may be exaggerated if there is a further tendency for smaller studies to be more prone to selective suppression of results than larger studies. This is often assumed to be the case for randomised trials. For instance, it is probably more difficult to make a large study disappear without trace, while a small study can easily be lost in a file drawer.21 The same may apply to specific outcomes—for example, it is difficult not to report on mortality or myocardial infarction if these are outcomes of a large study. Smaller studies have more sampling error in their effect estimates. Thus even though the risk of a false positive significant finding is the same, multiple analyses are more likely to yield a large effect estimate that may seem worth publishing. However, biases may not act this way in real life; funnel plots could be symmetrical even in the presence of publication bias or selective outcome reporting19 22—for example, if the published findings point to effects in different directions but unreported results indicate neither direction. Alternatively, bias may have affected few studies and therefore not cause glaring asymmetry. 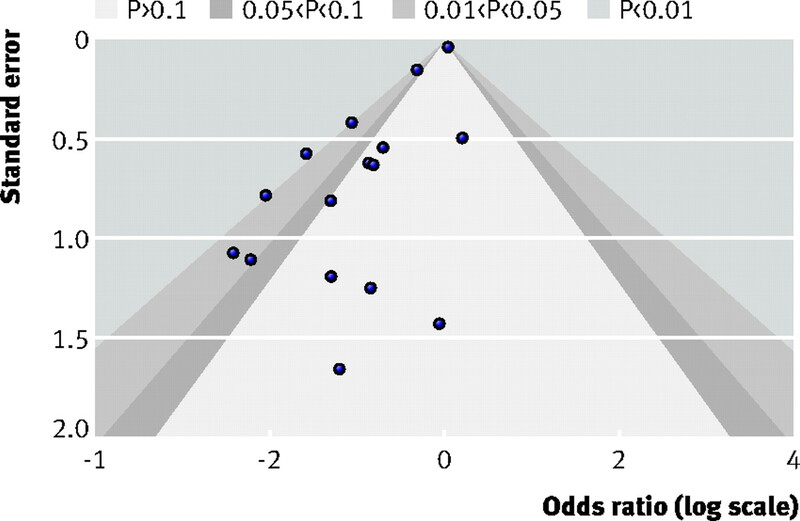 The role of chance is critical for interpretation of funnel plots because most meta-analyses of randomised trials in healthcare contain few studies.2 Investigations of relations across studies in a meta-analysis are seriously prone to false positive findings when there is a small number of studies and heterogeneity across studies,23 and this may affect funnel plot symmetry. 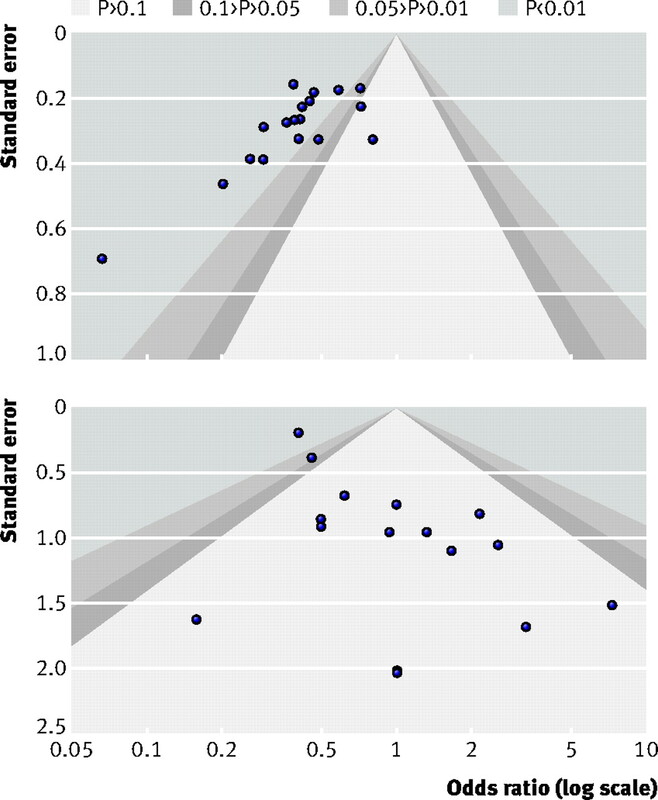 Authors of systematic reviews should distinguish between possible reasons for funnel plot asymmetry (box 1). Knowledge of the intervention, and the circumstances in which it was implemented in different studies, can help identify causes of asymmetry in funnel plots, which should also be interpreted in the context of susceptibility to biases of research in the field of interest. Potential conflicts of interest, whether outcomes and analyses have been standardised, and extent of trial registration may need to be considered. For example, studies of antidepressants generate substantial conflicts of interest because the drugs generate vast sales revenues. Furthermore, there are hundreds of outcome scales, analyses can be very flexible, and trial registration was uncommon until recently.24 Conversely, in a prospective meta-analysis where all data are included and all analyses fully standardised and conducted according to a predetermined protocol, publication or reporting biases cannot exist. Reporting bias is therefore more likely to be a cause of an asymmetric plot in the first situation than in the second. Terrin et al found that researchers were poor at identifying publication bias from funnel plots.5 Including contour lines corresponding to perceived milestones of statistical significance (P=0.01, 0.05, 0.1, etc) may aid visual interpretation.25 If studies seem to be missing in areas of non-significance (fig 3⇓, top) then asymmetry may be due to reporting bias, although other explanations should still be considered. If the supposed missing studies are in areas of higher significance or in a direction likely to be considered desirable to their authors (fig 3⇓, bottom), asymmetry is probably due to factors other than reporting bias. If there is substantial between study heterogeneity (the estimated heterogeneity variance of log odds ratios, τ2, is >0.1) only the arcsine test including random effects, proposed by Rücker et al, has been shown to work reasonably well.28 However, it is slightly conservative in the absence of heterogeneity and its interpretation is less familiar than for other tests because it is based on an arcsine transformation. When τ2 is <0.1, one of the tests proposed by Harbord et al,26 Peters et al,27 or Rücker et al28 can be used. Test performance generally deteriorates as τ2 increases. The trials of intravenous magnesium after myocardial infarction provide an extreme example of the differences between fixed and random effects analyses that can arise in the presence of funnel plot asymmetry.31 Beneficial effects on mortality, found in a meta-analysis of small studies,32 were subsequently contradicted when the very large ISIS-4 study found no evidence of benefit.33 A contour enhanced funnel plot (fig 4⇓) gives a clear visual impression of asymmetry, which is confirmed by small P values from the Harbord and Peters tests (P<0.001 and P=0.002 respectively). We recommend that when review authors are concerned about funnel plot asymmetry in a meta-analysis with evidence of between study heterogeneity, they should compare the fixed and random effects estimates of the intervention effect. If the random effects estimate is more beneficial, authors should consider whether it is plausible that the intervention is more effective in smaller studies. Formal investigations of heterogeneity of effects may reveal explanations for funnel plot asymmetry, in which case presentation of results should focus on these. If larger studies tend to be methodologically superior to smaller studies, or were conducted in circumstances more typical of the use of the intervention in practice, it may be appropriate to include only larger studies in the meta-analysis. An assumed relation between susceptibility to bias and study size can be exploited by extrapolating within a funnel plot. When funnel plot asymmetry is due to bias rather than substantive heterogeneity, it is usually assumed that results from larger studies are more believable than those from smaller studies because they are less susceptible to methodological flaws or reporting biases. Extrapolating a regression line on a funnel plot to minimum bias (maximum sample size) produces a meta-analytical estimate that can be regarded as corrected for such biases.35 36 37 However, because it is difficult to distinguish between asymmetry due to bias and asymmetry due to heterogeneity or chance, the broad applicability of such approaches is uncertain. Further approaches to adjusting for publication bias are described and discussed in the appendix. Contributors: All authors contributed to the drafting and editing of the manuscript. DA, JC, JD, RMH, JPTH, JPAI, DRJ, DM, JP, GR, JACS, AJS and JT contributed to the chapter in the Cochrane Handbook for Systematic Reviews of Interventions on which our recommendations on testing for funnel plot asymmetry are based. JACS will act as guarantor. Funding: Funded in part by the Cochrane Collaboration Bias Methods Group, which receives infrastructure funding as part of a commitment by the Canadian Institutes of Health Research (CIHR) and the Canadian Agency for Drugs and Technologies in Health (CADTH) to fund Canadian based Cochrane entities. This supports dissemination activities, web hosting, travel, training, workshops and a full time coordinator position. JPTH was funded by MRC Grant U.1052.00.011. DGA is supported by Cancer Research UK. GR was supported by a grant from Deutsche Forschungsgemeinschaft (FOR 534 Schw 821/2-2). Competing interests. JC, JJD, SD, RMH, JPAI, DRJ, PM, JP, GR, GS, JACS and AJS are all authors on papers proposing tests for funnel plot asymmetry, but have no commercial interests in the use of these tests. All authors have completed the ICJME unified disclosure form at www.icmje.org/coi_disclosure.pdf (available on request from the corresponding author) and declare that they have no financial or non-financial interests that may be relevant to the submitted work. 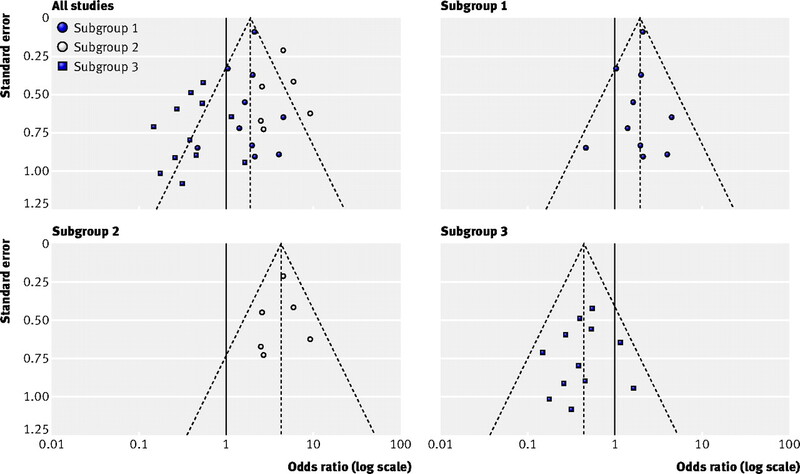 Egger M, Davey Smith G, Schneider M, Minder C. Bias in meta-analysis detected by a simple, graphical test. BMJ1997;315:629-34. Sterne JAC, Gavaghan D, Egger M. Publication and related bias in meta-analysis: power of statistical tests and prevalence in the literature. J Clin Epidemiol2000;53:1119-29. Lau J, Ioannidis JP, Terrin N, Schmid CH, Olkin I. The case of the misleading funnel plot. BMJ2006;333:597-600. Deeks JJ, Macaskill P, Irwig L. The performance of tests of publication bias and other sample size effects in systematic reviews of diagnostic test accuracy was assessed. J Clin Epidemiol2005;58:882-93. Terrin N, Schmid CH, Lau J. In an empirical evaluation of the funnel plot, researchers could not visually identify publication bias. J Clin Epidemiol2005;58:894-901. Ioannidis JP. Interpretation of tests of heterogeneity and bias in meta-analysis. J Eval Clin Pract 2008;14:951-7. Sterne JAC, Egger M, Moher D. Addressing reporting biases. In: Higgins JPT, Green S, eds. Cochrane handbook for systematic reviews of interventions. Wiley, 2008. Sterne JAC, Egger M. Funnel plots for detecting bias in meta-analysis: guidelines on choice of axis. J Clin Epidemiol2001;54:1046-55. Begg CB, Berlin JA. Publication bias: a problem in interpreting medical data. J R Statist Soc A1988;151:419-63. Davey Smith G, Egger M. Who benefits from medical interventions? Treating low risk patients can be a high risk strategy. BMJ1994;308:72-4. Stuck AE, Siu AL, Wieland GD, Adams J, Rubenstein LZ. Comprehensive geriatric assessment: a meta-analysis of controlled trials. Lancet1993;342:1032-6. Peters JL, Sutton AJ, Jones DR, Abrams KR, Rushton L, Moreno SG. Assessing publication bias in meta-analyses in the presence of between-study heterogeneity. J R Statist Soc A2010;173:575-91. Egger M, Jüni P, Bartlett C, Holenstein F, Sterne J. How important are comprehensive literature searches and the assessment of trial quality in systematic reviews? Empirical study. Health Technol Assess2003;7:1-68. Ioannidis JP. Why most discovered true associations are inflated. Epidemiology2008;19:640-8. Hopewell S, Clarke M, Stewart L, Tierney J. Time to publication for results of clinical trials. Cochrane Database Syst Rev2007;2:MR000011. 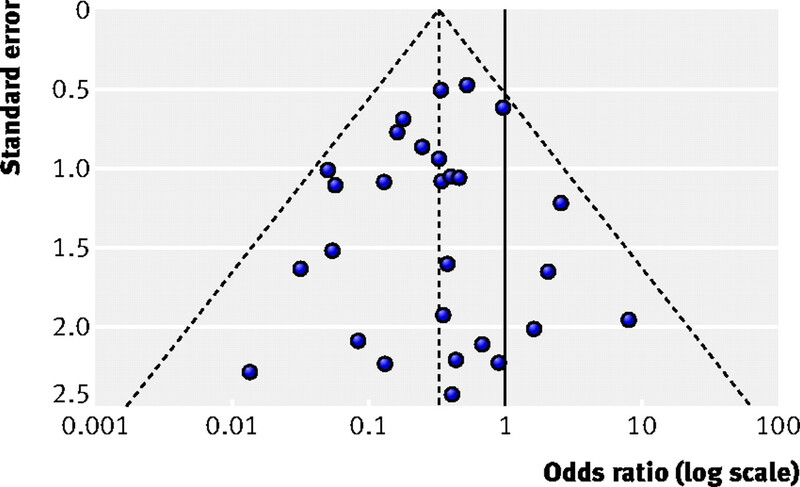 Hopewell S, Loudon K, Clarke MJ, Oxman AD, Dickersin K. Publication bias in clinical trials due to statistical significance or direction of trial results. Cochrane Database Syst Rev2009;1:MR000006. Song F, Parekh S, Hooper L, Loke YK, Ryder J, Sutton J, et al. Dissemination and publication of research findings: an updated review of related biases. Health Technol Assess2010;14:iii,ix-iii,193. Dwan K, Altman DG, Arnaiz JA, Bloom J, Chan AW, Cronin E, et al. Systematic review of the empirical evidence of study publication bias and outcome reporting bias. PLoS ONE2008;3:e3081. Turner EH, Matthews AM, Linardatos E, Tell RA, Rosenthal R. Selective publication of antidepressant trials and its influence on apparent efficacy. N Engl J Med2008;358:252-60. Rosenthal R. The “file drawer” problem and tolerance for null results. Psychol Bull1979;86:638-41. Chan AW, Hrobjartsson A, Haahr MT, Gotzsche PC, Altman DG. Empirical evidence for selective reporting of outcomes in randomized trials: comparison of protocols to published articles. JAMA2004;291:2457-65. Higgins JP, Thompson SG. Controlling the risk of spurious findings from meta-regression. Stat Med2004;23:1663-82. Ioannidis JP. Effectiveness of antidepressants: an evidence myth constructed from a thousand randomized trials? Philos Ethics Humanit Med2008;3:14. Peters J, Sutton AJ, Jones DR, Abrams KR, Rushton L. Contour-enhanced meta-analysis funnel plots help distinguish publication bias from other causes of asymmetry. J Clin Epidemiol2008;61:991-6. Harbord RM, Egger M, Sterne JA. A modified test for small-study effects in meta-analyses of controlled trials with binary endpoints. Stat Med2006;25:3443-57. Peters JL, Sutton AJ, Jones DR, Abrams KR, Rushton L. Comparison of two methods to detect publication bias in meta-analysis. JAMA2006;295:676-80. Rücker G, Schwarzer G, Carpenter J. Arcsine test for publication bias in meta-analyses with binary outcomes. Stat Med2008;27:746-63. Ioannidis JP, Trikalinos TA. The appropriateness of asymmetry tests for publication bias in meta-analyses: a large survey. CMAJ2007;176:1091-6. Poole C, Greenland S. Random-effects meta-analyses are not always conservative. Am J Epidemiol1999;150:469-75. Egger M, Davey Smith G. Misleading meta-analysis. Lessons from an “effective, safe, simple” intervention that wasn’t. BMJ1995;310:752-4. Teo KK, Yusuf S, Collins R, Held PH, Peto R. Effects of intravenous magnesium in suspected acute myocardial infarction: overview of randomised trials. BMJ1991;303:1499-503. ISIS-4 (Fourth International Study of Infarct Survival) Collaborative Group. ISIS-4: a randomised factorial trial assessing early oral captopril, oral mononitrate, and intravenous magnesium sulphate in 58,050 patients with suspected acute myocardial infarction. Lancet1995;345:669-85. 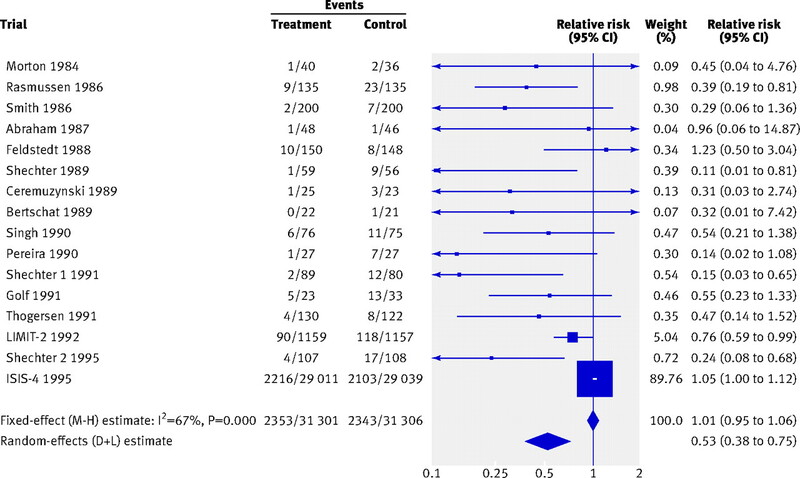 Early administration of intravenous magnesium to high-risk patients with acute myocardial infarction in the Magnesium in Coronaries (MAGIC) Trial: a randomised controlled trial. Lancet2002;360:1189-96. Shang A, Huwiler-Muntener K, Nartey L, Jüni P, Dörig S, Stene JA, et al. Are the clinical effects of homoeopathy placebo effects? Comparative study of placebo-controlled trials of homoeopathy and allopathy. Lancet2005;366:726-32. Moreno SG, Sutton AJ, Ades AE, Stanley TD, Abrams KR, Peters JL, et al. Assessment of regression-based methods to adjust for publication bias through a comprehensive simulation study. BMC Med Res Methodol2009;9:2. Rucker G, Schwarzer G, Carpenter JR, Binder H, Schumacher M. Treatment-effect estimates adjusted for small-study effects via a limit meta-analysis. Biostatistics2011;12:122-42. Moreno SG, Sutton AJ, Turner EH, Abrams KR, Cooper NJ, Palmer TM, et al. Novel methods to deal with publication biases: secondary analysis of antidepressant trials in the FDA trial registry database and related journal publications. BMJ2009;339:b2981. Eyding D, Lelgemann M, Grouven U, Härter M, Kromp M, Kaiser T, et al. Reboxetine for acute treatment of major depression: systematic review and meta-analysis of published and unpublished placebo and selective serotonin reuptake inhibitor controlled trials. BMJ2010;341:c4737. Kirkham JJ, Dwan KM, Altman DG, Gamble C, Dodd S, Smyth R, et al. The impact of outcome reporting bias in randomised controlled trials on a cohort of systematic reviews. BMJ2010;340:c365. Egger M, Schneider M, Davey Smith G. Spurious precision? Meta-analysis of observational studies. BMJ1998;316:140-4.